Goblin Raids is a distraction and diversion that allows players to collect low-leveled resources and accomplish what many new players have been trying to accomplish for years: wear goblin mail! 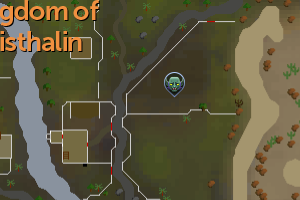 Goblins will raid a location once every thirty minutes. When a goblin raid is underway, a message giving the location the raiding party will be broadcast to all on the server. Higher leveled players will need to speak to the Lumbridge Doomsayer to see this message. 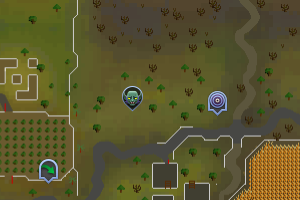 To pinpoint the location more precisely, open your world map and look for the Goblin Raids symbol . This will show the location of the raid. All possible raiding locations are in Asgarnia and Misthalin, so they should be easily accessible by all players. 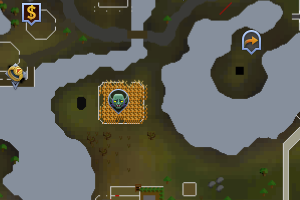 Wheat field north of Draynor-Teleport to the Draynor lodestone and then walk south to open the gate to enter the field. 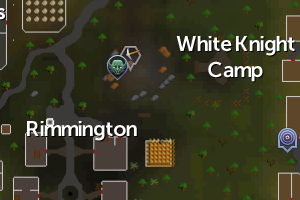 Mine west of Port Sarim-Teleport to the Port Sarim lodestone and walk northwest, or teleport to the White Knight camp using Remora's necklace (Song from the Depths required). 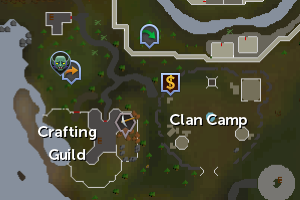 North of the Crafting Guild-Teleport to Clan Camp using a clan vexillium, or teleport to the Port Sarim lodestone and walk northwest. West of Varrock-Teleport to the Varrock Lodestone and then walk around the city walls to the west and then north. 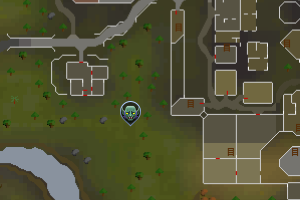 Lumbridge Farm-Teleport to the Varrock lodestone, then walk south until you meet to fork in the road. Open the gate to the cabbage patch and run south. 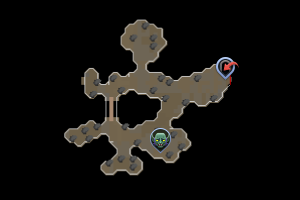 Lumbridge Copper Mine-Teleport to the Lumbridge lodestone and walk south, or teleport to the Al Kharid lodestone, walk west until you cross the Dungeoneering bridge, and then walk south. Taverley Wheat Field-Teleport to the Taverley lodestone and walk south. 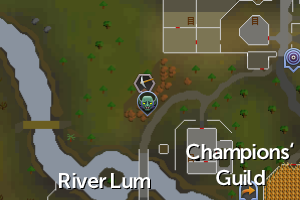 Champions' Guild Mine-Teleport to the Varrock lodestone and walk west. South of Varrock-Teleport to the Varrock lodestone and walk east to the yew tree. 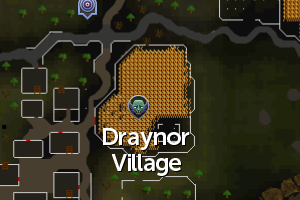 North of Draynor Village-Teleport to the Draynor lodestone and walk west. 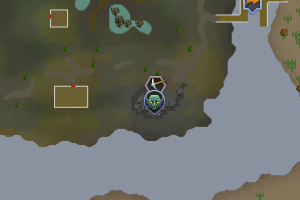 Taverley mine-Teleport to the Burthorpe lodestone and run south until you reach the mining and smithing area. The entrance to the mine is on the side of White Wolf Mountain. Once you arrive at the scene, talk to Hollowtoof. He is the only goblin with a shield and body armour, so he should be distinguishable from the rest of the goblins. You will intimidate him into giving you a raider equipment piece. After this, kill all goblins in the party. They are only level one with 50 lifepoints, so they should be easy to kill. After you kill all the level one goblins, Hollowtoof will become attackable. He is level four, has 140 lifepoints, and may drop one or two armour pieces. 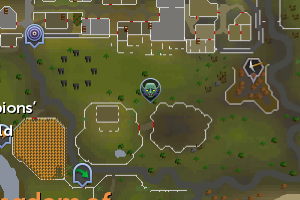 The unfortunate goblins will drop everything goblins usually do, including easy clue scrolls. In addition, they will drop logs, seeds, or ores, depending on where they were raiding. After you kill the entire party, three members of the Black Guard will teleport to the location. Talk to Commander Yodri and tell him that you have killed some goblins. He will give you logs, seeds, or ores, again depending on where the goblins were raiding. Logs and ores will be given in banknote form. You can also obtain raider equipment by intimidating or killing Hollowtoof. There are three pieces in the set: the raider axe, raider chainbody, and the raider shield. It is not very good equipment and should only be used for cosmetic purposes.